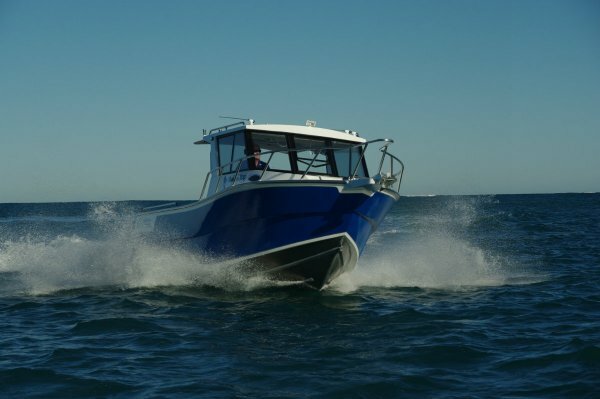 You see very few trailer boats bigger than the Coraline Outsider 800: 8.6m overall and massively constructed with a 6mm plate bottom and a forest of framing, which made me wonder what would be needed to pull it. A weighbridge doesn’t lie, and its answer was a usefully long list of fourbys and utes. With under 50L in the fuel tank the Coraline scaled 2.8T on its aluminium trailer; put in a typical fuel load and odds and ends and it might go up to 3.2T. A surprisingly modest figure. The 800’s size allows both a self-draining deck and coamings well up the thighs, normally a mutually exclusively coupling. 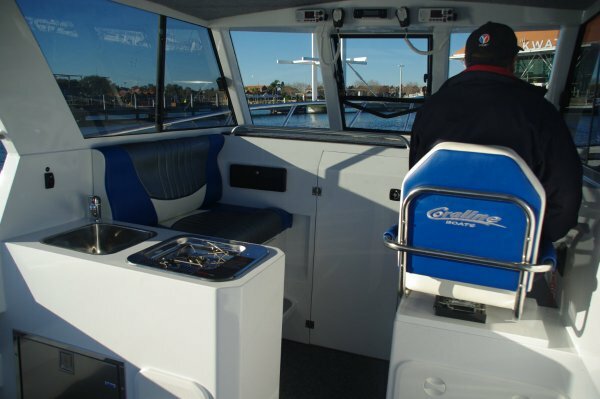 The rear bench is removable to give fishing access to the transom, so the total rail length available is substantial. The stability can handle a packed rail due, again, to the sheer size and to the broad reverse chines balancing the generous deadrise. For extra stability, the large catch tank could be flooded. Boats intended to travel out wide, especially those with large cockpits, need plenty of hand holds and the 800 has them. Side grab rails for most of the cockpit’s length, rails up the rear edges of the hardtop’s supports and more for the driver and offsider. 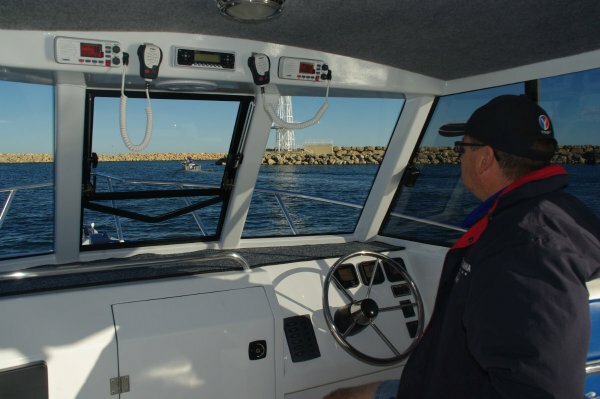 There are bow rails extending aft, but much more important for negotiating the side decks are the hardtop’s grab rails. The skipper gets an excellent seat. The first class passengers’ is good too, but theirs runs fore and aft. This is for the convenience of the galley’s placement; a galley that is more than just a token set up. There is a fridge, a one burner stove, and a sink plumbed to a 50L fresh water tank. Sharing this is a transom shower to complete the expedition facilities, although the extensive storage space probably counts as a facility. 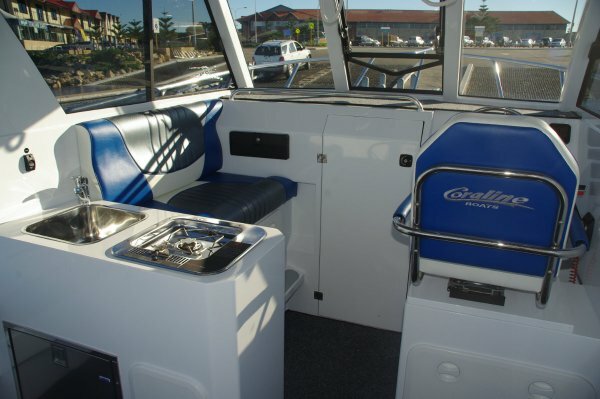 This ranges from under-seat and bunk space, via side pockets to transom lockers. Closed hardtops can create stifling spaces, but the combination of an opening windscreen centre, sliding side glass, and the fore hatch on bad days fixes any ventilation problems. 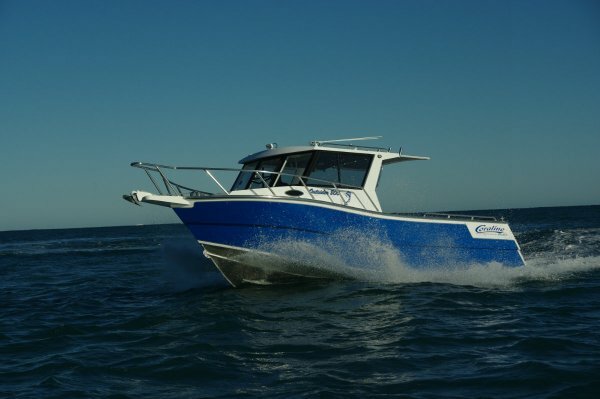 The recommended power range is between 250 and 350hp. 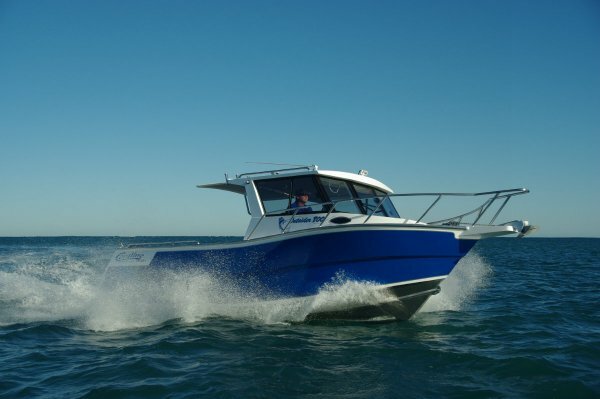 The review boat went for the intermediate 300hp which proved a happy medium. The motor was the lightweight, large capacity Yamaha V6, which behaved like practically all current four-strokes: instant start, smooth running, low noise, fool proof controls, and progressive throttle response. It still feels like witchcraft to an old timer. It was on the exuberant side of adequate power, giving a speed in the high 30s and reaching it in quick time. 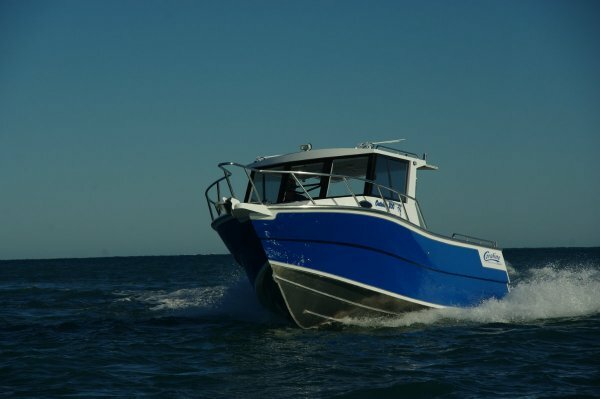 No-one is going to treat the Coraline like a sports boat, but speed and good handling are always useful, and the ability to deliver comfort at speed is especially welcome in a boat that will cover big distances. A good trailer is necessary for the other kind of big distances, and the Coraline has it. Coraline themselves built this beauty, tailored exactly to the hull. 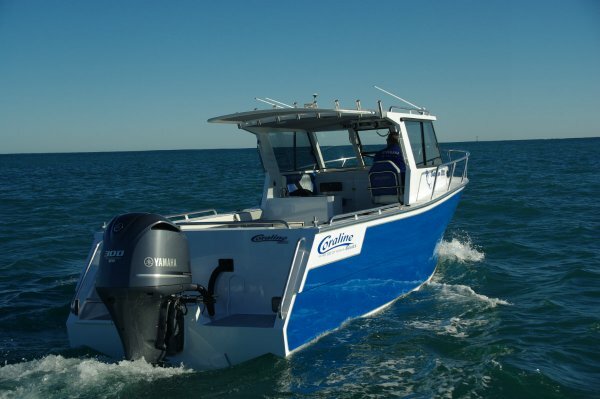 Sitting low on multiple keel rollers, amid super-low friction side bunks, it is a dream to tow and a breeze to launch and recover. And it has the item all trailers need: a gangway to use when hooking on instead of trying to balance on the trailer frame (and usually falling off; sound familiar? ).